Our four-year-old had a friend over. I was watching a basketball game while they played nearby. They began discussing their respective lineages. How four-year-olds get into such a discussion, I don’t know. There must be something about toy trains that leads naturally into ancestry. I let the ballgame fade away as I focused myself upon a little parental eavesdropping. I wanted to know what my son had retained from the things I’d told him about his family. “My grandfather was a soldier,” he told his friend. That was very nearly correct. It was his great-grandfather, but that’s all the same to a preschooler. “He died when he got old,” my son continued. Correct. He was about 70, which seems ancient when you’re four. Grandsister? I don’t know what closet he pulled her out of; I’m sure I’ve never mentioned a sickly grandsister. What? I’m sitting right here! Number 1: You’re clearly lying. Number 2: It’s rude to speak of someone’s grisly death right in front of him. Number 3: If you’re going to tell people I’m dead, at least act a little cut up over it! His friend pointed out that I was quite nearby, and although I displayed all the vigor of a declining couch potato, it was clear that I still clung to my low-grade existence. My son dropped the subject and picked up a locomotive engine. Is he a psychic, unwittingly foretelling my violent demise? Well, he didn’t see a Time Out coming when he threw a tennis ball at the TV screen, so his psychic powers can’t be too polished. Am I seeing him in the future, when I really am shot and killed? It still wouldn’t hurt him to show a little grief over the event. Does he see dead people (i.e. me)? Well, if I’m already dead, his friend, his brother, his mother, all my co-workers, and the guy who flipped me off in traffic this morning can see me too, which gives death no advantages over life. After the shock of my untimely end wore off, I realized the truth. It had nothing more to do with the Twilight Zone than that my boy might have written for the show if he’d been around at the time. The kid is a storyteller. He likes storytelling so much that he blurts out the plot before taking time to review its plausibility. He said I died because he wanted to keep the story going and the word father came to him before he could conjure up a grandbrother. The boy likes to spin a yarn, and since I have never been one to embellish any story or make any tale taller by a few inches, I can only blame his mother. 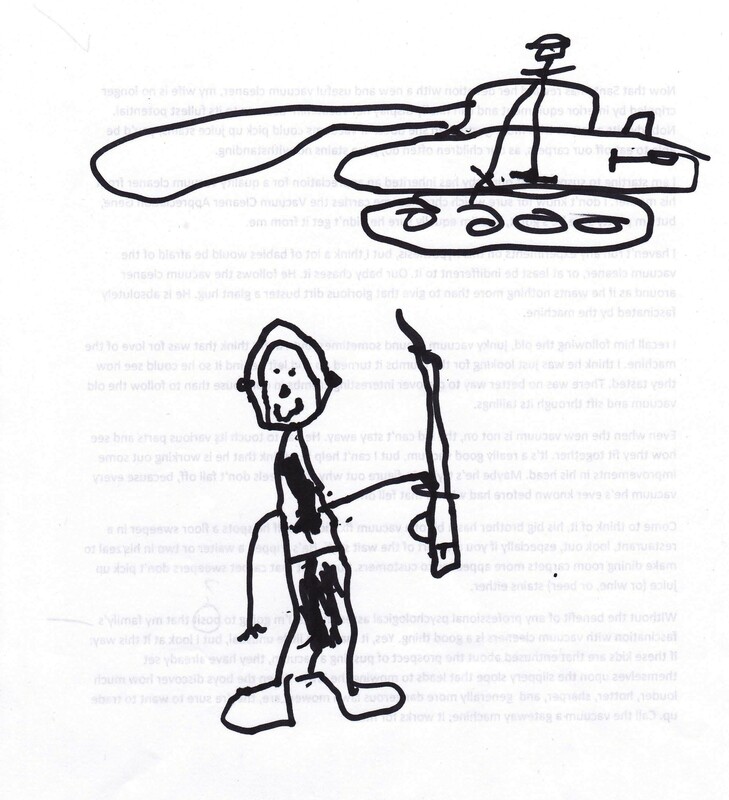 A storyteller and an artist too: This is the boy’s illustration of his great-grandfather. I can only assume that the stain on his uniform is mud and/or coffee. War is dirty business, and, if this soldier was anything like his great-grandchildren, most of his drinks ended up on his clothes. This entry was posted in Little Weirdos and tagged children, family, family history, fatherhood, humor, kids, parenting, premature burial, Twilight Zone. He probably has you confused with Lincoln. An easy mistake to make, but Lincoln was taller and did his best writing on envelopes. People mistake me for Lincoln all the time. Maybe it’s because this blog is of the people, by the people, and for the people. Again, you had me in tears I was laughing so hard. Too funny! This seems like an odd thing to say but thanks for tearing up, Sandy. Additional point to make: if you’re going to lie, at least clear the area of those who can blow the lid right off your story. Another great post! Yes. The boy is still struggling with the concept of plausibility. I have confidence that he will develop into an expert liar before too long. It just takes a little time. Please give my condolences to your wife. And may you rest in peace…on the sofa…as you snooze. My wife accepts your kind condolences, but she says it’ll be a cold day in hell when she lets me rest in peace on the sofa; those dishes aren’t gonna wash themselves. You had me in stitches. Or rather, your boy did, since a dead man obviously can’t make jokes. He’s the man of the family now, in charge of making jokes, and of course, avenging my death. I laughed so hard through this one. Sorry to hear of your tragic and untimely potential demise. Everyone should strive to die up to their potential. I lost it on this post. Sorry you’re dead, Scott, but I guess it couldn’t be helped. After all… THE STORY MUST GO ON! My only regret is that I had only one life to give for his implausible story.